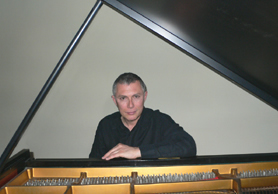 Stuart Hutchinson studied piano at the Royal Academy of Music with Alexander Kelly and Madeleine Windsor and piano accompaniment with John Streets. Stuart graduated from the Academy with the Licentiate Diploma (LRAM), the Professional Diploma and an Honours Degree from London University. He continued private studies with Geoffrey Parsons. Stuart made his debut as an accompanist at the Purcell Room, and soon after that recitals followed at the Queen Elizabeth Hall and the Wigmore Hall. He was honoured in 1981 by the Incorporated Society of Musicians with their Young Artist Award and was subsequently a featured young artist in award schemes promoted by Live Music Now (Director: Yehudi Menuhin), The Park Lane Group (contemporary music) and South East Arts. He has made a number of recordings for BBC Radio 3, including works by twentieth-century British and American composers. A recording featuring the music of Percy Grainger won the Sony Radio Recording Award for BBC Radio 4. He participated in the first live broadcast for Classic FM. Stuart Hutchinson has made a number of appearances on BBC, Independent and Channel 4 television - including Omnibus and Pebble Mill - giving the first broadcast performance of the Six Poems of Marina Tzvetaeva by Shostakovitch. He is in demand as accompanist and coach to many leading British and International singers – and has appeared in recital with Kathryn Harries, Joan Rodgers, Anne-Marie Owens, Jean Rigby and David Wilson-Johnson. In master classes he has been accompanist for Dame Janet Baker, Gerhardt Husch, Renata Tebaldi and Pierre Bernac.